Since its founding in 2005, MFCI has been providing the equipment necessary for a safe delivery to various developing areas in the world. Millennium Development Goals (MDGs) are eight goals to be achieved by 2015 that respond to the world’s main development challenges. Donations to MFCI will also help purchase fetal monitors, prenatal vitamins, delivery kits, surgical supplies, insecticide-treated bednets and HIV/AIDS medications. Every minute a woman in the developing world dies from pregnancy-related causes that are mostly preventable or treatable. Every 30 seconds a child dies as a result of its mother’s death. Dr. Lisa Masterson and Stephen Masterson founded MFCI in 2005 to help mothers and children survive and enjoy better health in the poorest regions of the world. 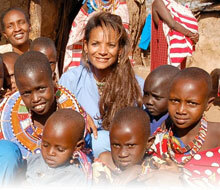 MFCI brings volunteer physicians to treat needy women and children. MFCI also provides training to local healthcare personnel to elevate the standard of available medical care and decrease mother-child transmission of HIV/AIDS. Copyright Â© 2011 Maternal Fetal Care International. All rights reserved. Site design by Globo Giganticom.